ITV news called it, “a Jubilee party which confirmed London as a melting-pot of cultures and a protector of those who need it most”. The music was Brazilian, the food Afghan, but British Future’s Jubilee street party this past Friday was unmistakably British. 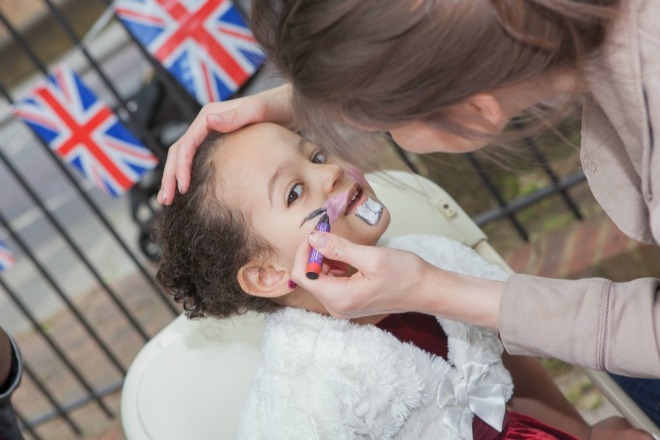 Bunting, face paint and tea were in plentiful supply for everyone present, many of whom were refugees that had fled violence and persecution to come to Britain over the last six decades of the Queen’s reign. Organised by the Refugee Council, the event saw people from all corners of the globe come together to celebrate and give thanks to the country that gave them sanctuary. Paul Sathianesan, who came to the UK from Sri Lanka in 1985 and has since been a mayor and local councillor for the borough of Newham, called it “a special day for us to say thanks and celebrate…it’s an opportunity to get to know each other, to integrate and feel proud”. 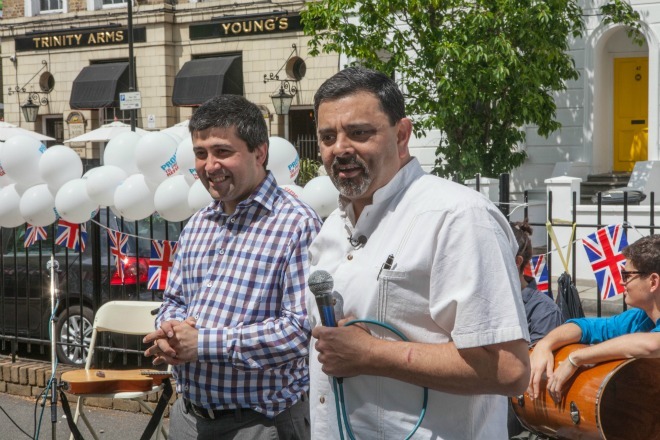 Celebrity chef and restaurateur Cyrus Todiwala kicked off the proceedings at Trinity Gardens in Brixton with a rousing speech that highlighted the contribution refugees have made in both his birthplace of India and in his current home of Britain. “I’m here to celebrate the coming together of all the different communities and to celebrate the Diamond Jubilee and show that this is as British as it gets,” said Cyrus. After an afternoon filled with Jubilee-themed cakes, music and socialising, refugees recreated an iconic photo taken 60 years ago of Vietnamese refugees holding a banner thanking the Queen for sanctuary in Britain. 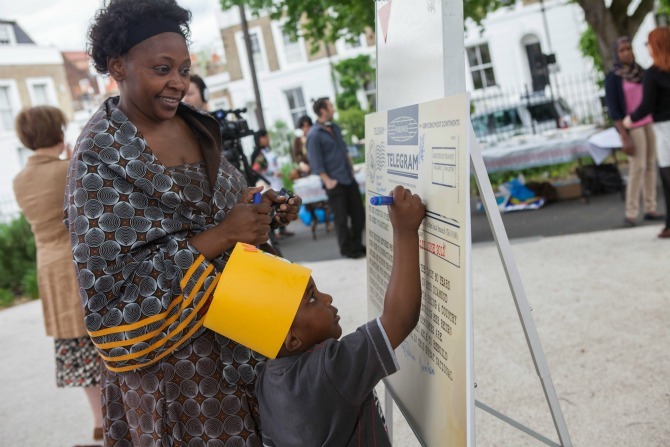 A giant telegram was also on display at the street party that was signed by attendees and sent to the Queen congratulating her on her Diamond Jubilee. “The telegram is about sanctuary. We really want to say thank you to the Queen, thank you to the British people for giving us sanctuary. We couldn’t have asked for anything more and that’s the telegram saying it all. And that’s why we’re here, we’re here to say thank you,” said Ugandan refugee Grace Adok. Perhaps surprising to some, new Britons are often the most proud of being British. Research carried out by Ipsos MORI for British Future showed those born outside the UK felt a slightly higher level of strong belonging to Britain (70%) than those born in the UK (66%). “Moments like the Jubilee make us feel like we share more in common than we think. Maybe that means we can come together and discuss difficult issues,” said British Future director Sunder Katwala.